The announcement of Detroit’s bankruptcy was a long time coming with much ink being spilled on the city’s demographic conflagrations and mismanagement. The collapses of the city’s economic base that supported the jobs that kept the people in the area, to the out and out criminal activity of municipal office holders, all have given the City of Detroit the infamous title of being the largest municipal bankruptcy in American history. Just over a week ago, after a year in bankruptcy Michigan Governor, Rick Snyder signed the so called “Grand Bargain” that is seen as a key step in moving the city forward. This occasions was greeted with reflections on the present and future of Detroit and one of the more interesting articles that I stumbled across was on Foreign Policy (published over a year ago) about how in the late 1940s, Detroit was in the running to host the United Nations. Although I largely agree with the author that there is no way to tell if Detroit had been successful in putting the United Nations HQ on Belle Isle if it would be in the same predicament as today, it is an interesting counter-factual to examine. United Nations Headquarters is staffed by some 5000 individuals, with a starting wage currently just over $30,000 plus benefits annually. The vast majority of these positions are paid at much higher rates as most employees are white collar professionals with university degrees and multilingual backgrounds. Beyond these 5000 staffers, there are 194 members nations with 115 of them having embassies in New York City. If you assume that all of these nations would have embassies in Detroit (or the surrounding area), you are likely to see several hundred if not thousand foreign embassy officials and their families living and working in the city. The presences of the UN would have transformed the local universities in Detroit and southeast Michigan into feeder programs for UN jobs, research institutions, NGOs and lobbying firms. While not-for-profits, NGOs and other institutions would sprout up around the UN. One caveat to this potential bonanza is that UN employees are generally exempt from host state income taxes (they do pay a portion of tax to their home country) as well as things like parking ticket. As for property taxes, individual employees who purchase homes that are not official diplomatic missions are required to pay property tax but the missions themselves are exempt. Although employees would pay consumption taxes, the tax boast to the city would likely not have been as large as if the same number of jobs were created in the private sector. The arrival of the UN certainly would have had an impact on the finances of Detroit. As mentioned above the addition of thousands of jobs to the city would naturally have impacts even with the exemptions UN employees are granted. Beyond the direct tax income, Detroit would have been the beneficiary of large sums of state and federal funds. Upgrades to infrastructure, airports, police and fire, security and other services would have all likely come on the dime of other levels of government. Of course Detroit’s history of fiscal management is not a great one. Corruption in City Hall has been pointed too as one of the primary reasons for the city’s financial struggles. Whether the presence of the UN in Detroit would have helped prevent these problems by providing state and federal oversight or exacerbated them with outside money being siphoned off is a matter for debate. The UN itself would also likely pay for some services. If the Headquarters were situated on Belle Island (as was planned), it is quite likely that the entire island would have been turned over to the United Nations. As a result, the parkland would be maintained and operated by UN, thus saving the costs to the city or state. It is also likely that the UN would contribute to various social programs and NGOs in the city of Detroit thus assisting in the application of social services and community development. Beyond employment, the United Nations is a tourist destination in its own right. Each year approximately 1 million people visit the United Nations Headquarters in New York City. To be fair, the Motor City isn’t the Big Apple, so to assume a 1 for 1 transfer of tourists from one city to the other is a little optimistic. With over 8 million people visiting Detroit compared to 50.9 million visiting New York city, the Big Apple has a much larger entertainment and cultural base through which to attract visitors. The largest annual event in Detroit is the North American International Auto Show which in 2014 over a one week period brought in 803,451 people through its doors. Unlike the Auto Show, the United Nations is what I would call a one time tourist event, what I mean by that is that it doesn’t usually attract local visitors several times a year or on an annual basis. Generally you go to the UN once, take the tour and then move on to see other things. As a result the UN would only serve as a tourism incentive in conjunction with other attractions. But even if the UN attracted half the number of tourists in Detroit as it does in New York the impact on the downtrodden city would be immense. One aspect of the UN that will attracted visitors annually is the meeting of the General Assembly which brings dozens of world leaders to the UN along with their staff. Although these aren’t tourists per say and the numbers of attendees will likely vary by country and year it would likely mean hotels and restaurants will be filled dignitaries and officials. 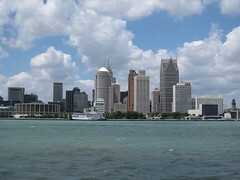 The arrival of key politicians would also highlight and market Detroit through various international media outlets. Additionally through out the year, UN HQ plays host to numerous events, conferences and meetings that would bring diplomats, business people, philanthropists and politicians from around the world to Detroit. Naturally the presences of the UN (assuming it was placed on Belle Isle as the original plan called for) would have re-orientated the city of Detroit . Neighbourhood along the Jefferson Corridor and the lower East Side of the city would have likely seen some resiliency in their populations and housing due to the presences of the UN. According to current data provided by Data Driven Detroit (2010) portions of the Jefferson Corridor are already one of the stronger areas of the city in terms of both resident income and housing occupancy. The presences of the UN on Belle Isle would likely have further improve this part of Detroit. The result would likely been a spillover beyond stronger residential and income statistics in the Jefferson corridor and the Lower East-side into neighbouring areas. The region would likely have seen an influx of office space to serve the various embassies; restaurants/cafes/bars to feed and entertain diplomats and employees; and improved transit and infrastructure to get them to and from work. All of which would have improved livability and standards of living in the city. The impact of the UN being on Belle Isle would effect areas beyond Detroit. It is likely Canada and other nations would put their UN Embassies on the Canadian side of the Detroit River meaning offices and employees in the City of Windsor. It would have also been likely that many UN employees would have come from Canada and would live on the Canadian side of the border, choosing to commute to work rather then live on the American side. At minimum we would see a ferry running from Belle Isle to Windsor to the UN along with the possible reorientation of the entire cross border infrastructure. The question of whether the UN presences in Detroit would have any impact on the social issues that the city has faced is another important one. One of the predominant stories about Detroit decline has been the “white flight” from the city to the suburbs. This then helped contribute to the reputation of Detroit decline as white collar workers moved from the city and eventually businesses followed. What was left were abandon buildings, high crime rates and sense of hopelessness that entrapped many Detroit residence who could not afford to move away. The UN would have anchored a large number of white collar jobs in the city’s core and on Belle Isle. The question really becomes whether those positives could outweigh the negative headwinds that the city faced since the 1970s. It is likely that UN programs in the community would have supported portions of Detroit and certain neighbourhoods would have seen some resiliency. It is also possible that the UN could have become a symbol for everything that some Detroiters see wrong with the city: segregation and the American dream being out of reach, as UN employees drive from their comfortable suburban homes, through the broken neighbourhoods of Detroit to work without a second look at the city. What can be taken from this hypothetical is that the UN would not have saved Detroit. Despite possibly strengthening portions of the city’s social fabric and finances and the presence of the United Nations would not have stopped Detroit’s politicians from spending irresponsibility for decades nor the demographic cacophony that gripped the city . The UN could have been a symbol of hope and change for Detroit but it could have just as easily become a symbol of segregation and missed opportunities. There is no telling what could have been, all that can be done now is hope for the city’s future. ← Turks and Caicos and Canada – A match made in heaven?